Israel Aerospace Industries (IAI) introduces the new generation ELI-3360 Maritime Patrol Aircraft (MPA) based on a modified Bombardier Global 5000 business-jet platform. Designed by IAI’s ELTA Group to provide maritime domain situational awareness and maritime superiority, the new MPA provides the most sophisticated surveillance, reconnaissance and armament systems to be installed on a business-jet to date. The system incorporates the advanced ELTA ELM-2022 Maritime Patrol Radar, an electro-optical sensor, the ELL-8385 ESM/ELINT (Electronic Support Measures/Electronic Intelligence) system, and a comprehensive communications suite comprising radios, broadband SATCOM (Satellite Communications) and data-links as well as advanced Electronic Warfare (EW) and self-protection Suite. The integrated multi-mission Command & Control Suite includes multi-purpose operator workstations and a weapon and stores management system, which controls the under-wing weapons that may include torpedoes and anti-ship missiles for Anti-Submarine Warfare (ASW) and Anti Surface Warfare (ASuW) as well as dispensable Search & Rescue (SAR) stores. The new generation ELI-3360 joins IAI’s series of Special Mission Aircraft (SMA), and is based on IAI’s 30 years of experience in supplying advanced maritime domain sensors and integrated systems to leading customers worldwide. 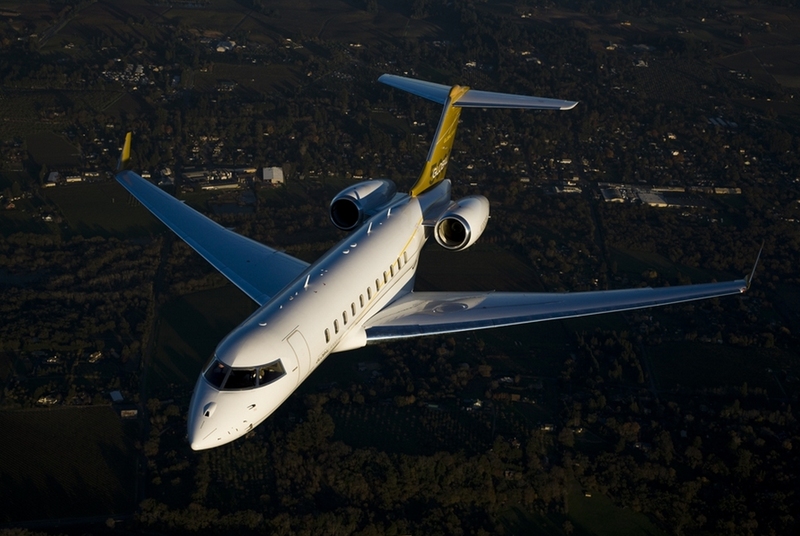 IAI’s line of business-jet SMA includes the operationally proven Gulfstream G550 Conformal Airborne Early Warning (CAEW), and the G-V Signal Intelligence Aircraft (SEMA) – the world’s first business-jet based mission aircraft. Since IAI’s pioneering conception of business-jet SMA, the SMA market has moved steadily over the past decade towards cost-effective business jets. High endurance, speed, range and multi-mission versatility of such SMAs is unmatched by large commercial transport aircraft or turbo-props. «IAI provides leading-edge airborne, maritime and land-based solutions for persistent maritime reconnaissance and surveillance», said Nisim Hadas, IAI Executive VP and ELTA President. 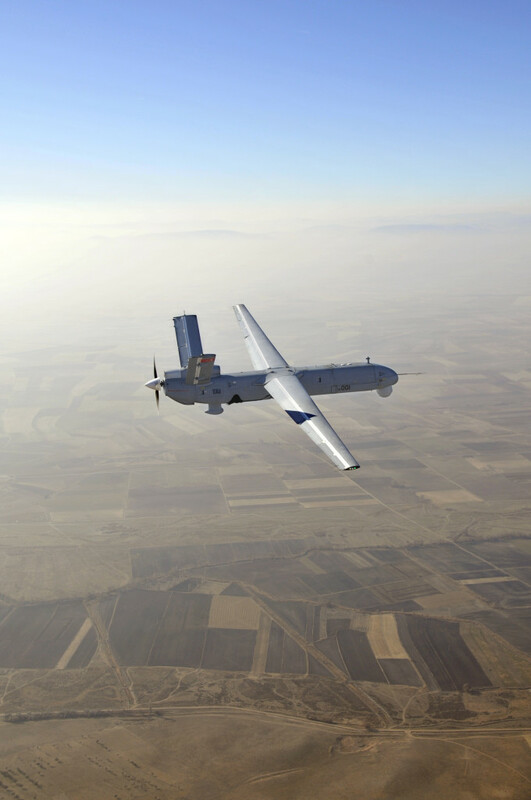 «This allows our customers a choice of the right combination of ISR assets to meet their operational needs. The new business-jet based MPA, in concert with UAS and shore-based systems will provide unmatched maritime domain superiority for the benefit of our customers». «We are delighted that IAI ELTA continues to put their confidence in the Global 5000 aircraft, relying on the platform to host its integrated mission solutions», said Stephane Villeneuve, Vice President, Specialized Aircraft, Bombardier. 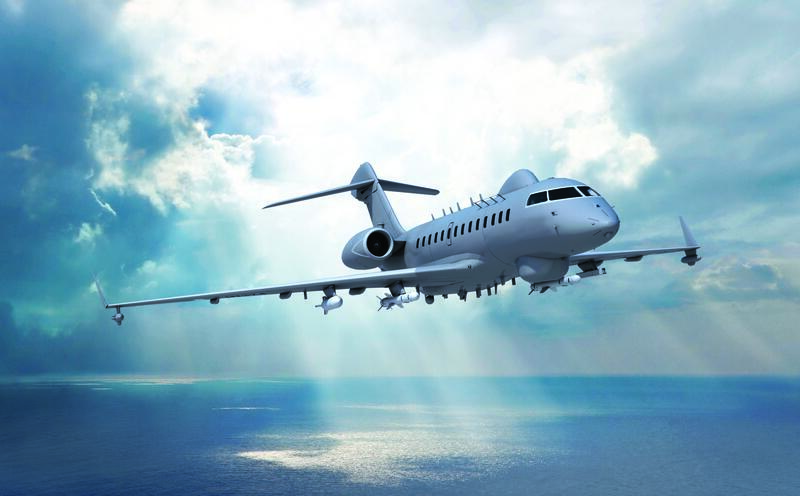 «With its superior operational capabilities, the Global 5000 aircraft is the ideal choice for IAI ELTA’s next generation Maritime Patrol Aircraft». 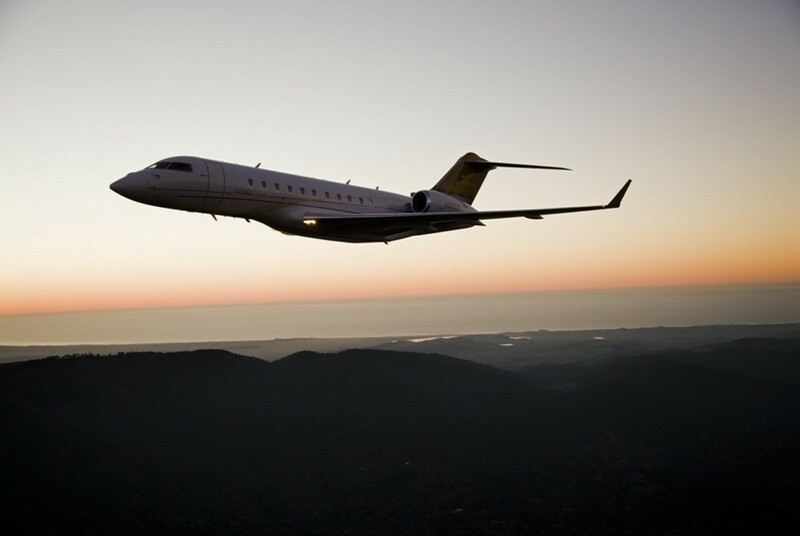 The Global 5000 business jet is designed to deliver optimized comfort, speed and range. It is unsurpassed in its class, with superior cabin spaciousness, technologies and aesthetics. It’s extraordinary short-field and non-stop transcontinental capabilities, combined with its leading-edge flight deck reduce pilot workload and increase situational awareness giving unprecedented peace-of-mind. Grace, power and levels of performance without compromise. RNAV (Area Navigation), En-route RNP & RNP AR (Required Navigation Performance Authorization Required) Approaches. * Theoretical range with NBAA IFR (National Business Aviation Association Instrument Flight Rules) Reserves, ISA (International Standard Atmosphere), 8 pax/3 crew. Actual range will be affected by speed, weather, selected options and other factors. 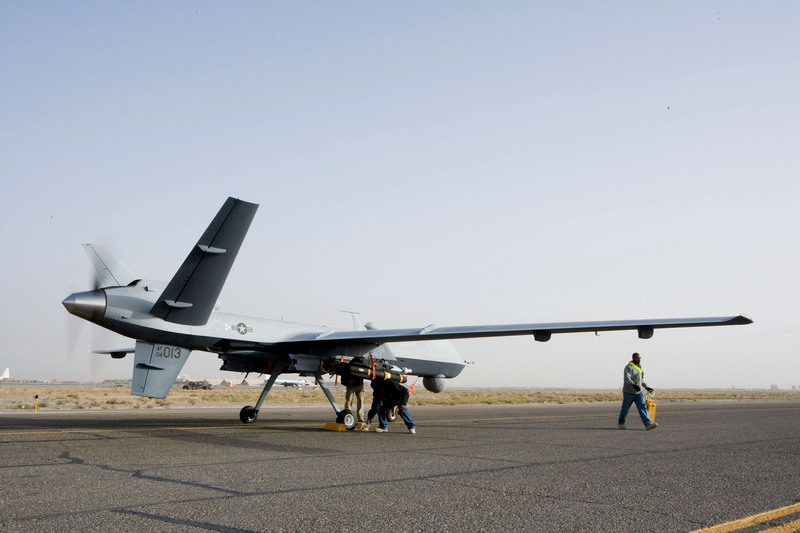 The State Department has made a determination approving a possible Foreign Military Sale to the Netherlands for MQ-9 Reapers and associated equipment, parts and logistical support for an estimated cost of $339 million. The Defense Security Cooperation Agency delivered the required certification notifying Congress of this possible sale. 14 Honeywell H-764 Adaptive Configurable Embedded Global Positioning System/Inertial Guidance Units (EGI) with Selective Availability Anti-Spoofing Module (SAASM) (12 installed and 2 spares). Also provided are an Initial Spares Package (ISP) and Readiness Spares Package (RSP) to support 3400 Flight Hours for a three year period, support and test equipment, publications and technical documentation, personnel training and training equipment, U.S. Government and contractor engineering, technical and logistics support services, and other related elements of logistical and program support. The estimated cost is $339 million. The Netherlands is one of the major political and economic powers in Europe and NATO and an ally of the United States in the pursuit of peace and stability. It is vital to the U.S. national interest to assist the Netherlands to develop and maintain a strong and ready self-defense capability. This potential sale will enhance the Intelligence, Surveillance, and Reconnaissance (ISR) capability of the Dutch military in support of national, NATO, UN-mandated, and other coalition operations. Commonality of ISR capabilities will greatly increase interoperability between U.S. and Dutch military and peacekeeping forces. The Netherlands requests this capability to provide for the defense of its deployed troops, regional security, and interoperability with the U.S. The proposed sale will improve the Netherland’s capability to meet current and future threats by providing improved Intelligence, Surveillance, and Reconnaissance coverage that promotes increased battlefield situational awareness, anticipates enemy intent, augments combat search and rescue, and provides ground troop support. The Netherlands will have no difficulty absorbing this additional capability into its armed forces. The proposed sale of this equipment and support will not alter the basic military balance in the region. The principal contractor will be General Atomics Aeronautical Systems, Inc. in San Diego, California. There are no known offset agreements proposed in connection with this potential sale. Implementation of this proposed sale may require U.S. contractor representatives to make multiple trips to the Netherlands and potentially to deployed locations to provide initial launch, recovery, and maintenance support. There will be no adverse impact on U.S. defense readiness as a result of this proposed sale. This notice of a potential sale is required by law and does not mean the sale has been concluded. 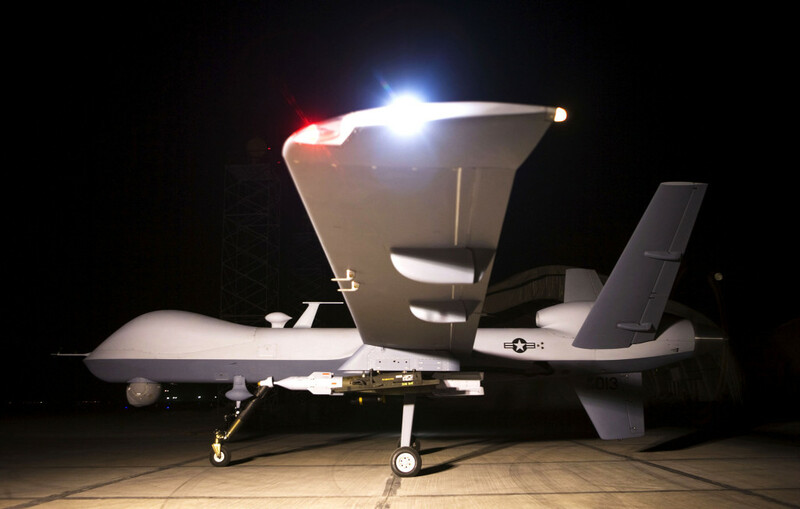 Designated as MQ-9 Reaper by its U.S. Air Force and Royal Air Force customers, the turboprop-powered, multi-mission Predator B Unmanned Aircraft System (UAS) was developed with GA-ASI funding and provides significantly greater capabilities than Predator. 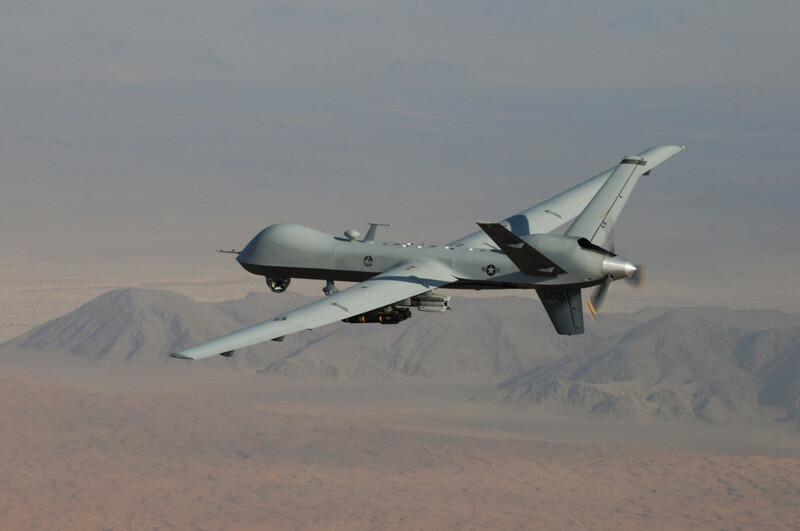 First flown in 2001, Predator B is a highly sophisticated development built on the experience gained with GA-ASI’s battle-proven Predator UAS and a major evolutionary leap in overall performance and reliability. Featuring unmatched operational flexibility, the multi-mission Predator B has an endurance of over 27 hours, speeds of 240 KTAS (Knots True AirSpeed)/276 mph/444 km/h, can operate up to 50,000 feet/15,240 m, and has a 3,850 lbs (1,746 kg) payload capacity that includes 3,000 lbs (1,361 kg) of external stores. Twice as fast as Predator, it carries 500% more payload and has nine times the horsepower. Predator B provides a long-endurance, persistent surveillance/strike capability for the war fighter. An extremely reliable aircraft, it is equipped with a fault-tolerant flight control system and triple redundant avionics system architecture. Predator B is engineered to meet and exceed manned aircraft reliability standards. The Predator B multi-mission aircraft is highly modular and is easily configured with a variety of payloads to meet mission requirements. Predator B is capable of carrying multiple mission payloads to include: Electro-Optical/Infrared (EO/IR), Lynx Multi-mode Radar, multi-mode maritime surveillance radar, Electronic Support Measures (ESM), laser designators, and various weapons packages. Through its Airborne Launch Assist Space Access (ALASA) program, Defense Advanced Research Projects Agency (DARPA) has been developing new concepts and architectures to get small satellites into orbit more economically on short notice. Bradford Tousley, director of DARPA’s Tactical Technology Office, provided an update on ALASA at the 18th Annual Federal Aviation Administration (FAA)’s Commercial Space Transportation Conference in Washington, D.C. Tousley discussed several key accomplishments of the program to date, including successful completion of Phase 1 design, selection of the Boeing Company as prime contractor for Phase 2 of the program, which includes conducting 12 orbital test launches of an integrated prototype system. «We’ve made good progress so far toward ALASA’s ambitious goal of propelling 100-pound (45 kg) microsatellites into Low Earth Orbit (LEO) within 24 hours of call-up, all for less than $1 million per launch», Tousley said. «We’re moving ahead with rigorous testing of new technologies that we hope one day could enable revolutionary satellite launch systems that provide more affordable, routine and reliable access to space». The 24-foot (7.3-meter) ALASA vehicle is designed to attach under an F-15E aircraft. Once the airplane reaches approximately 40,000 feet (12,192 meters), it would release the ALASA vehicle. The vehicle would then fire its four main engines and launch into Low Earth Orbit to deploy one or more microsatellites weighing up to a total of 100 pounds (45 kilograms). Launches of microsatellites for the Department of Defense (DoD) or other government agencies require scheduling years in advance for the few available slots at the nation’s limited number of launch locations. This slow, expensive process is causing a bottleneck in placing essential space assets in orbit. The current ALASA design envisions launching a low-cost, expendable launch vehicle from conventional aircraft. Serving as a reusable first stage, the plane would fly to high altitude and release the launch vehicle, which would carry the payload to the desired location. «ALASA seeks to overcome the limitations of current launch systems by streamlining design and manufacturing and leveraging the flexibility and re-usability of an air-launched system», said Mitchell Burnside Clapp, DARPA program manager for ALASA. «We envision an alternative to ride-sharing for microsatellites that enables satellite owners to launch payloads from any location into orbits of their choosing, on schedules of their choosing, on a launch vehicle designed specifically for small payloads». ALASA had a successful Phase 1, which resulted in three viable system designs. In March 2014, DARPA awarded Boeing the prime contract for Phase 2 of ALASA. Because reducing cost per flight to $1 million presents such a challenge, DARPA is attacking the cost equation on multiple fronts. The Phase 2 design incorporates commercial-grade avionics and advanced composite structures. Perhaps the most daring technology ALASA seeks to implement is a new high-energy monopropellant, which aims to combine fuel and oxidizer into a single liquid. If successful, the monopropellant would enable simpler designs and reduced manufacturing and operation costs compared to traditional designs that use two liquids, such as liquid hydrogen and liquid oxygen. Automatic flight-termination systems that would assess real-time conditions during flight and end it if necessary. DARPA plans to continue developing these capabilities in Phase 2 and, once they’re sufficiently mature, intends to eventually transition them to government and/or commercial partners for wider use in the space community. Pending successful testing of the new monopropellant, the program plan includes 12 orbital launches to test the integrated ALASA prototype system. 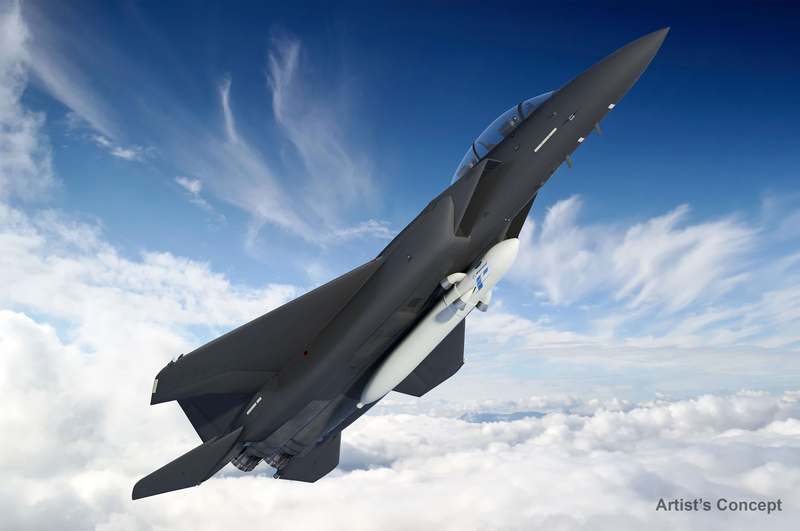 Currently, DARPA plans to conduct the first ALASA flight demonstration test in late 2015 and the first orbital launch test in the first half of 2016. Depending on test results, the program would conduct up to 11 further demonstration launches through summer 2016. If successful, ALASA would provide convenient, cost-effective launch capabilities for the growing government and commercial markets for small satellites. «Small satellites in the ALASA payload class represent the fastest-growing segment of the space launch market, and DARPA expects this growth trend to continue as small satellites become increasingly more capable», Burnside Clapp said. «The small-satellite community is excited about having dedicated launch opportunities, and there should be no difficulty finding useful payloads». Lewis B. Puller, the first purpose built at-sea platform for Mine CounterMeasure (MCM) helicopters and Special Operations Forces (SOF) was christened at the General Dynamics NASSCO shipyard in San Diego, California on February 7, 2015, according to the company. U.S. Marine Corps commandant Gen. Joseph Dunford was the guest speaker at the ceremony. 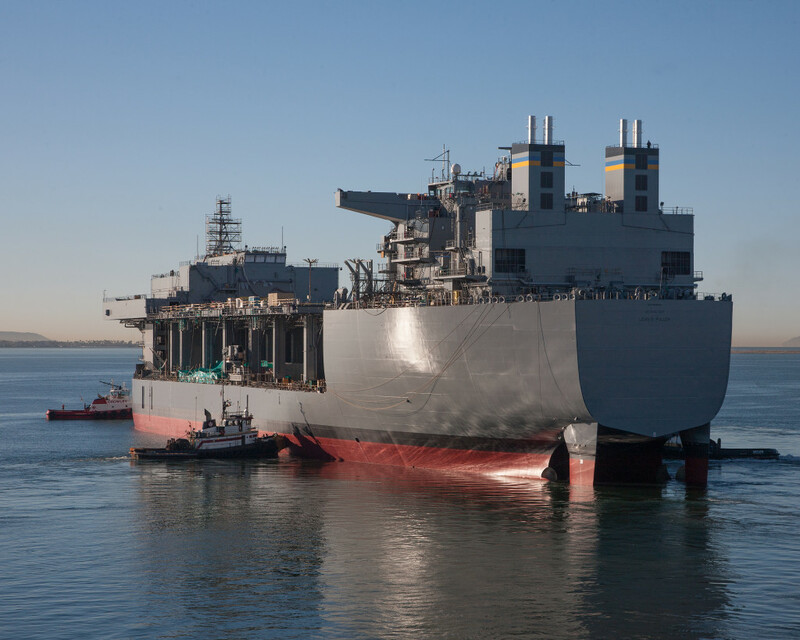 The Afloat Forward Staging Base – USNS Lewis B. Puller (MLP-3/ASFB-1) – was formally named in a ceremony at NASSCO ahead of an anticipated delivery to U.S. Military Sealift Command (MSC) in September. The ship is capable of supporting additional missions including: counter-piracy operations, maritime security operations, humanitarian aid and disaster relief missions and Marine Corps crisis response. 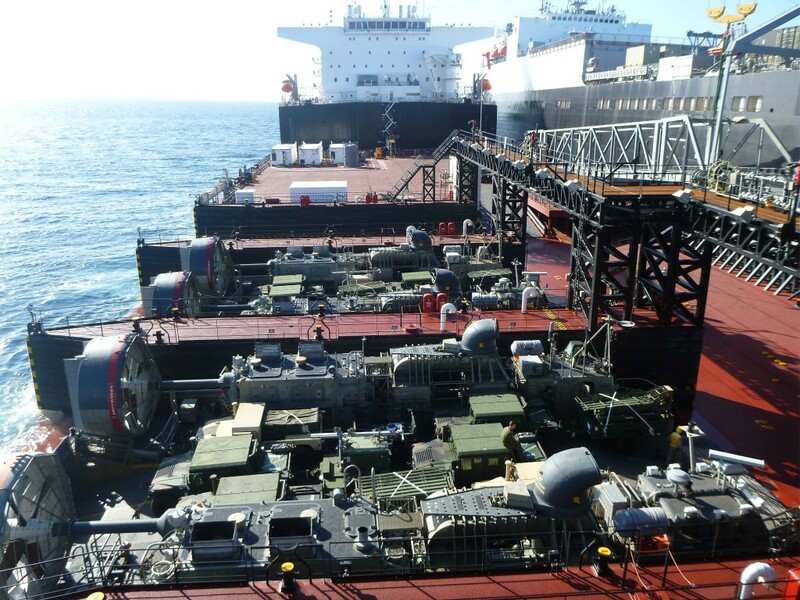 The first two ships (USNS Montford Point and USNS John Glenn) have been designated Mobile Landing Platforms (MLP) and will operate as an interface between MSC (Military Sealift Command) cargo ships and Navy landing craft to expand the projection power of the U.S. Marine Corps. The two planned ships in the class plan to be forward deployed assets for the Navy – one to the U.S. 5th Fleet in the Middle East and one to the U.S. 7th Fleet in the Pacific. The Navy currently employs the Austin-class LPD, USS Ponce (AFSB-(I)-15), as a Middle East AFSB. In December 2014, Naval Sea Systems Command (NAVSEA) awarded NASSCO $498 million to start construction on the second AFSB. The MLP AFSB – based on the hull of an Alaska-class crude oil tanker – is a flexible platform and a key element in the Navy’s large-scale airborne mine countermeasures mission. 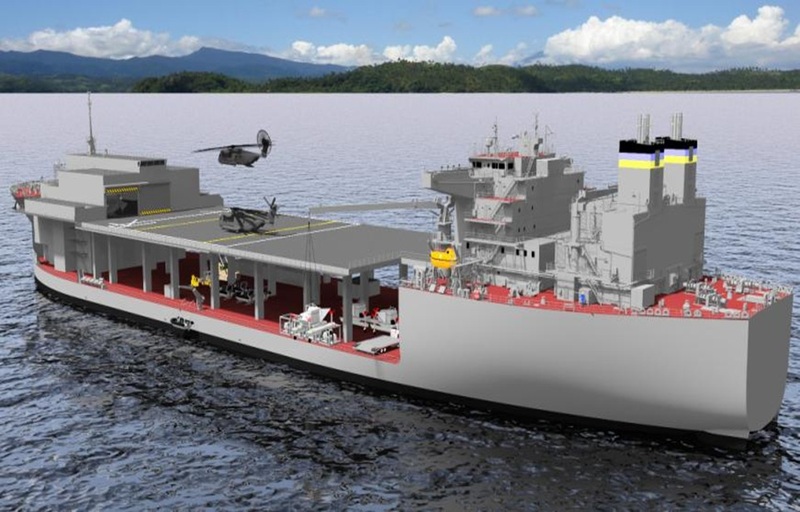 With accommodations for 250 personnel and a large helicopter flight deck (capable of fielding MH-53E Sea Dragon MCM helicopters), the MLP AFSB will provide a highly capable, innovative and affordable asset to the Navy and Marine Corps. 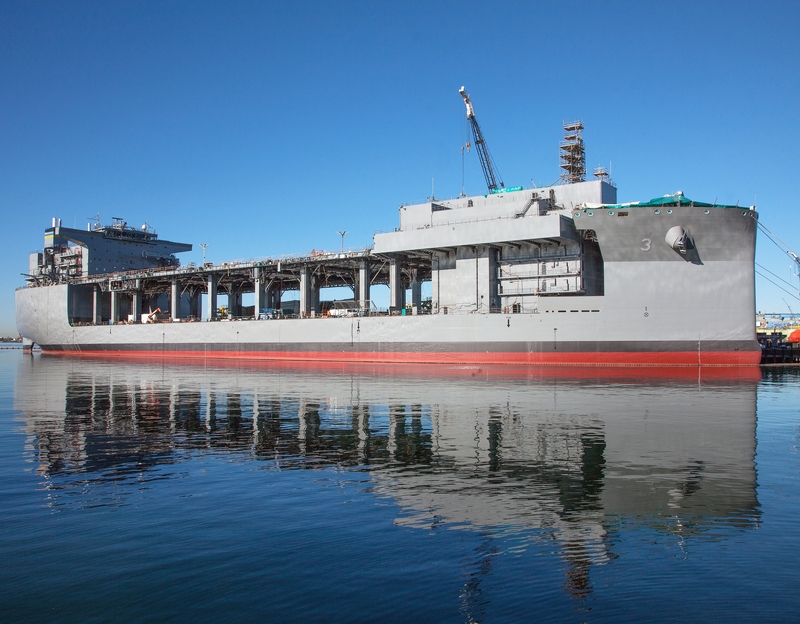 USNS Lewis B. Puller (MLP-3/AFSB-1) was launched at the San Diego yard on November 6, 2014. Lewis B. Puller is slated to become operational in 2015 and will likely replace the current AFSB stand in – USS Ponce (AFSB-(I)-15). The second ship (MLP-4/AFSB-2) will most likely based in the Pacific. SAN DIEGO (Nov. 6, 2014) The mobile landing platform Lewis B. Puller (T-MLP-3/T-AFSB-1) successfully completed launch and float-off at the General Dynamics National Steel and Shipbuilding Co. (NASSCO) shipyard. According to Sam LaGrone, USNI Online Editor at the U.S. Naval Institute, engineering studies to include an electromagnetic railgun on a Zumwalt-class destroyer (DDG-1000) have started at Naval Sea Systems Command (NAVSEA). The work will do the math to determine if the Zumwalt-class will have the space, power and cooling to field a railgun – likely replacing one of the two 155-mm BAE Advanced Gun Systems (AGS) ahead of the ship’s deck house, Vice Adm. William Hilarides told USNI News following remarks at the Office of Naval Research Naval Future Force Science and Technology Expo. «We have begun real studies – as opposed to just a bunch of guys sitting around – real engineering studies are being done to make sure it’s possible». The likely candidate for the weapon would be the third planned Zumwalt, Lyndon B. Johnson (DDG-1002) currently under construction at General Dynamics Bath Iron Works (BIW) with an expected delivery date of 2018. 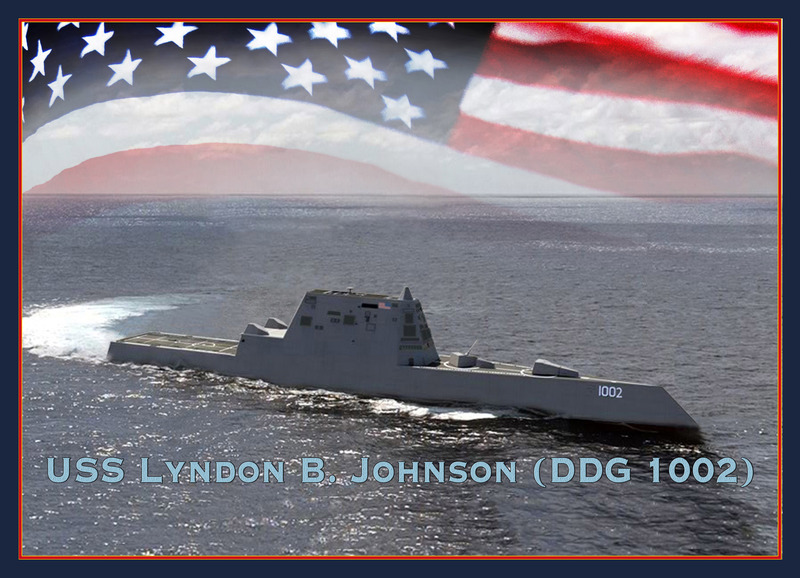 Hilarides said the first two ships – Zumwalt (DDG-1000) and Michael Monsoor (DDG-1001) – would be less likely to field the capability initially due to the schedule of testing with the new class. «The team is working diligently now but it would not happen until after delivery of the ships – probably the third ship is where we’d have it», he said. «That would certainly be my recommendation». 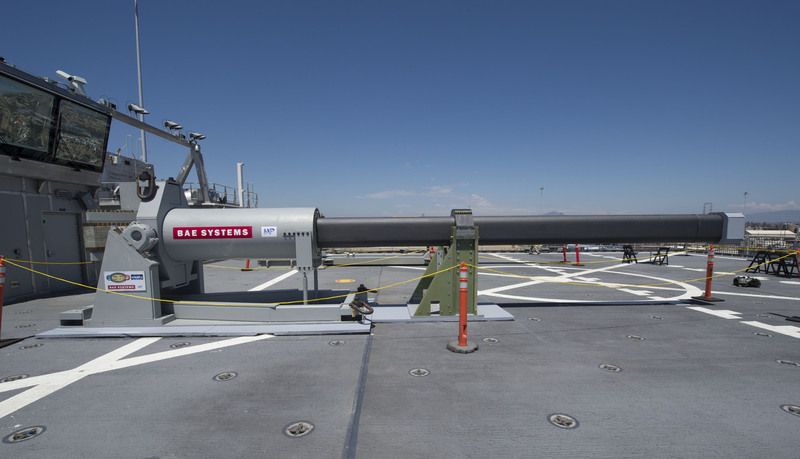 The Navy is in early stages of testing and fielding a railgun – which forgoes the gunpowder in the shells of conventional naval guns and instead uses high-powered electromagnetic pulses along a set of rails to shoot a projectile at supersonic speeds. 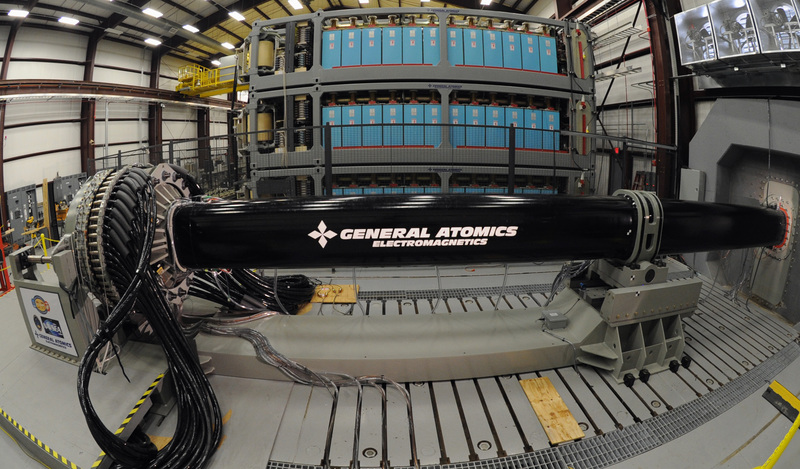 The Navy plans to test a BAE Systems prototype railgun onboard the Joint High Speed Vessel USNS Millinocket (JHSV-3). 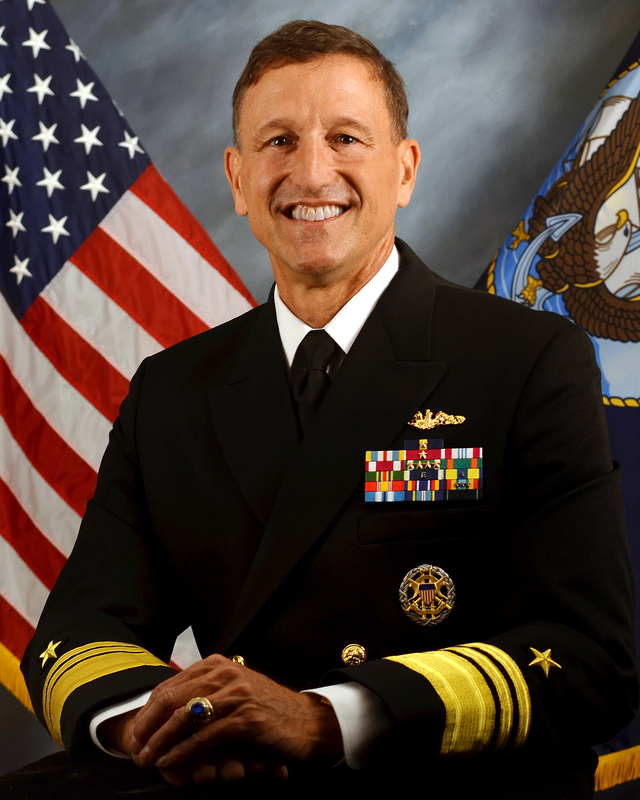 Last year, then Navy director of surface warfare now commander of U.S. Surface Forces Command, Vice Adm. Thomas Rowden told USNI News the Zumwalts would be likely used as test beds for emerging technologies like railguns and directed energy weapons the Navy wants for its next large surface combatant due to the ship’s size an ability to generate power. The Integrated Power System (IPS) on the 16,000-ton ships – powered by two massive Rolls Royce MT-30 gas turbines and two smaller Rolls-Royce RR450 – allow the ships to route and generate 80 mega-watt power – much more electrical power than the current crop of U.S. destroyers and cruisers. Chief of Naval Operations Adm. Jonathan Greenert said a Zumwalt would likely be the first ship to get the capability. The inclusion of the railgun does mean a capabilities trade for the ship. «We’ll go do the studies and I suspect they’ll say ‘yes,’ but it’s going to come at a cost of some of the capabilities on this ship – of course», Hilarides said. «It’s physics. Without taking something off, you’re not putting on a many ton system, so a gun would be a logical thing to take off and put the railgun in its place». The three ship Zumwalt-class were – in part – originally designed to address a gap in naval surface fire support with the AGS firing the Long-Range Land Attack Projectile (LRLAP) at a range of up to 75 nautical miles/139 km. 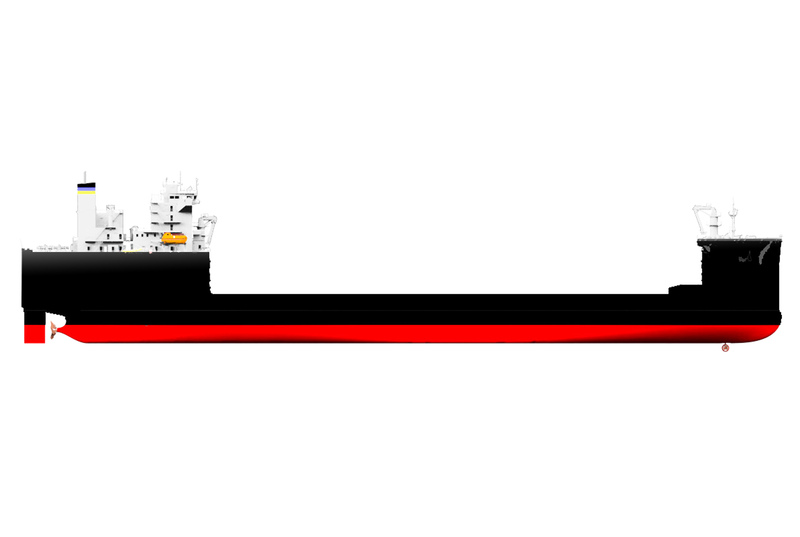 Each ship is designed to field two AGS. Zumwalt is expected to deliver to the service next year. 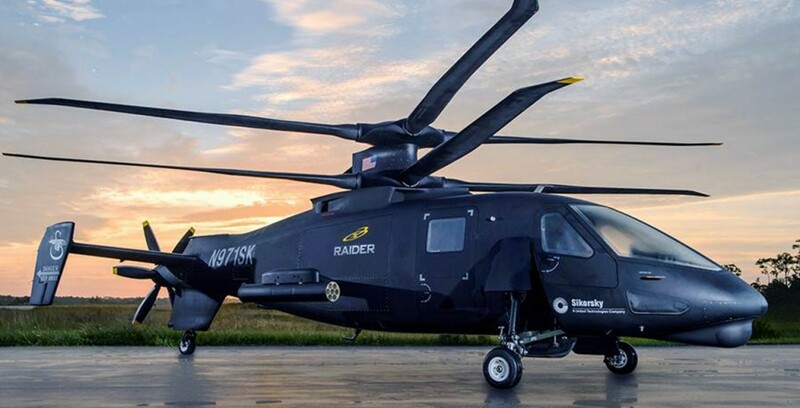 Sikorsky Aircraft Corp., a subsidiary of United Technologies Corp., announced the start of bladed ground testing, a major milestone, for the S-97 Raider program. 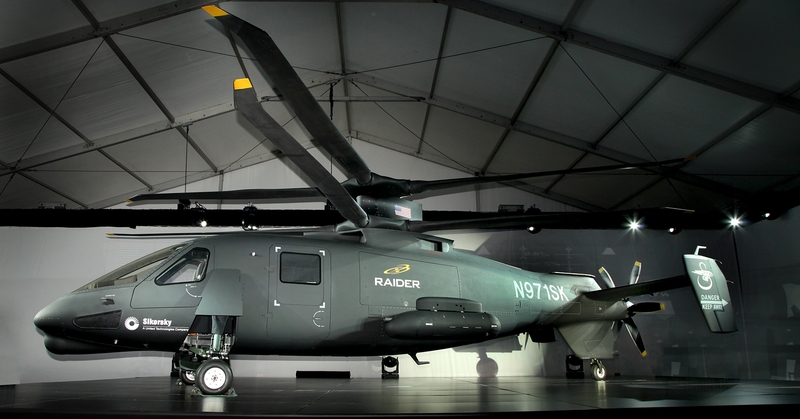 The Raider is an armed reconnaissance rotorcraft designed to significantly outmatch conventional military helicopters in maneuverability, payload, speed, range and high/hot environmental conditions. «Testing all of the aircraft’s systems together, for the first time, marks significant progress in the development of this next generation helicopter and moves the program closer to first flight», said S-97 Raider Program Manager Mark Hammond. This testing comes on the heels of the recent successful completion of software qualification testing, component fatigue testing, and gearbox testing, for the first S-97 Raider prototype. Sikorsky launched the S-97 Raider program in October 2010 with the objectives of maturing the X2 rotorcraft design and offering a helicopter to meet U.S. Army reconnaissance and special operations needs. In addition to ground runs for the first prototype, the program team at Sikorsky’s Development Flight Center in West Palm Beach, Florida, is prepared to begin final assembly of the second prototype S-97 Raider helicopter, following acceptance last month of the fuselage structure from Aurora Flight Sciences. Sikorsky rolled out the first prototype in October 2014. Based on Sikorsky’s rigid X2 rotor coaxial design, the S-97 Raider helicopter features next-generation technologies in a multi-mission configuration, capable of carrying six troops and external weapons. The coaxial counter-rotating main rotors and pusher propeller provide cruise speeds up to 220 knots/253 mph/407 km/h. «We look forward to the opportunity to demonstrate the Raider’s revolutionary performance and unmatched maneuverability for the U.S. Army», said Steve Engebretson, Director, Advanced Military Programs. «We’re delivering on our promise to design and build a helicopter with performance capabilities not seen before». The S-97 Raider aircraft multi-mission capabilities will meet both conventional U.S. Army and Special Operations future requirements in a variety of combat roles. Sikorsky is also reviewing potential applications for USAF, U.S. Navy, and U.S. Marine Corp services. Like the X2 Technology Demonstrator aircraft that unofficially broke the helicopter speed record on September 15, 2010, the S-97 Raider helicopter prototypes will feature twin coaxial counter-rotating main rotors (in place of one main rotor and a tail rotor) and a pusher propeller. For the armed reconnaissance mission, the S-97 Raider helicopter will have space aft of the cockpit for armament and auxiliary fuel. In an assault configuration, the cabin will afford space to accommodate up to six troops. In addition to flying at nearly twice the speed of a conventional helicopter, the S-97 Raider prototype aircraft will incorporate other key performance parameters critical to combat operations – increased maneuverability, greater endurance, and the ability to operate at high altitudes. Compared with other light military helicopters, the Raider prototypes are expected to significantly reduce turning radius and acoustic noise signature, while significantly increasing the aircraft’s payload, flight endurance and hot and high hover capability. * HOGE – Hover-Out of Ground Effect. This is the absolute limit of the helicopter’s ability to hover. Factors that contribute to this limit are density altitude, atmospheric temperature, available engine torque, and payload. Embraer successfully performed the first flight of the new military transport and aerial refueling jet, the KC-390 on February 3, 2015. Test pilots Mozart Louzada and Marcos Salgado de Oliveira Lima and flight test engineers Raphael Lima and Roberto Becker flew the aircraft for 1 hour and 25 minutes, conducting an evaluation of flying qualities and performance. «This first flight is a fundamental step toward accomplishing the task with which we were entrusted. The KC-390 is the result of a close cooperation with the Brazilian Air Force and international partners, representing what is most likely the greatest technological challenge that the Company has ever encountered in its history. We are profoundly moved for having achieved this key milestone», said Frederico Fleury Curado, President and CEO of Embraer. «The program continues to move forward as planned and the KC-390 has drawn interest from several countries around the world», added Jackson Schneider, President and CEO of Embraer Defense & Security. «We are proud to once again keep our commitments in the development of this aircraft, which will set a new standard in the category of tactical military transport». «The KC-390 will be the backbone of transport aviation for the Brazilian Air Force. From the Amazon to Antarctica, the fleet of 28 aircraft will play a key role in the diversity of projects of the Brazilian State, from scientific research to the maintenance of sovereignty», noted Aeronautics Commander, Lieutenant-Brigadier General Nivaldo Luiz Rossato. On its maiden flight, the KC-390 crew performed maneuvers to evaluate its flight characteristics and conducted a variety of systems tests, having benefited from an advanced campaign of simulations and extensive ground tests. «The KC-390 behaved in a docile and predictable manner», said Captain Louzada. «The advanced fly-by-wire flight control system and the latest-generation avionics make flying easy and render a smooth and precise flight». 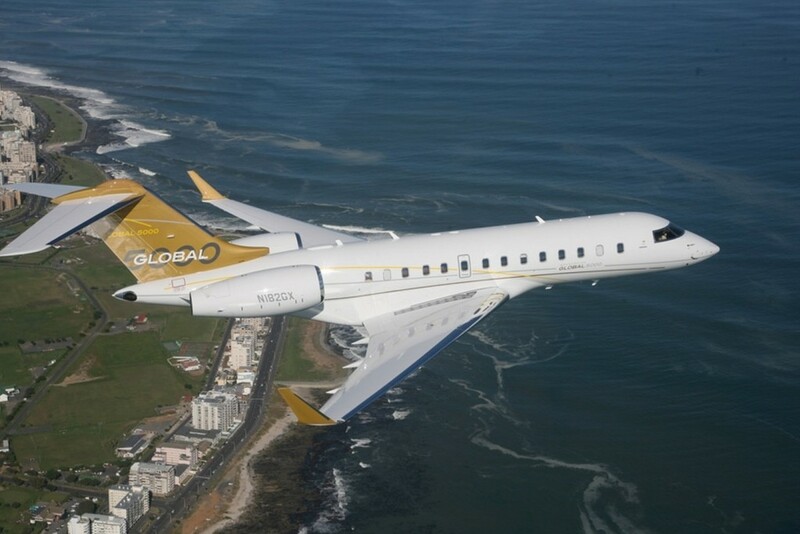 According to Guy Norris from Aerospace Daily & Defense Report, Embraer originally hoped to begin test flights before the end of last year, but took longer than expected to complete a final series of avionics integration tests following the aircraft’s rollout in October. 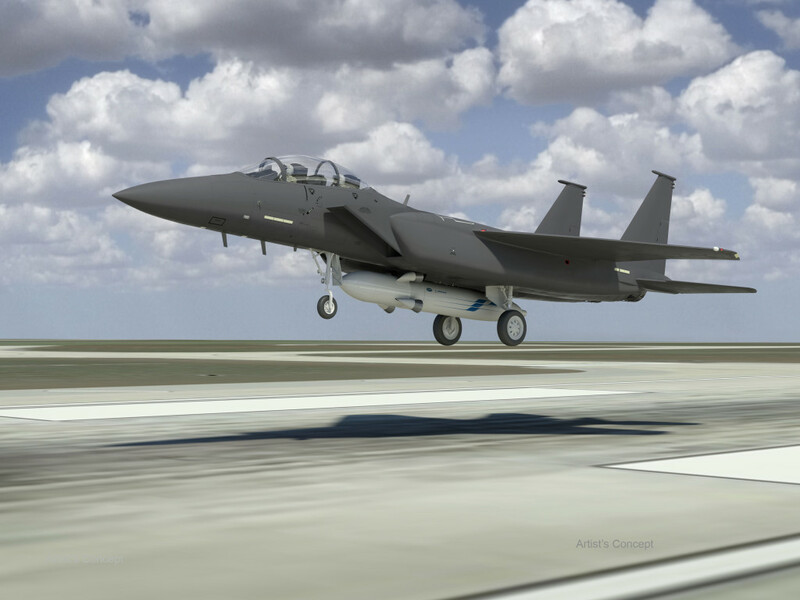 The manufacturer has targeted initial deliveries to the Brazilian air force around the end of 2016, though this looks more likely to slide into 2017 given the ambitious flight test effort ahead of it. A second KC-390 has also been assembled and is set to join the program shortly. Embraer has so far taken firm orders for 28 aircraft from Brazil, but is confident the fly-by-wire transport could clinch up to 20% of the Lockheed Martin Hercules C-130 replacement market, which it estimates is around 728 aircraft in 77 countries. The KC-390 is a joint project of the Brazilian Air Force and Embraer to develop and produce a tactical military transport and air-to-air refueling plane that represents a significant advance in terms of technology and innovation for the Brazilian aeronautics industry. 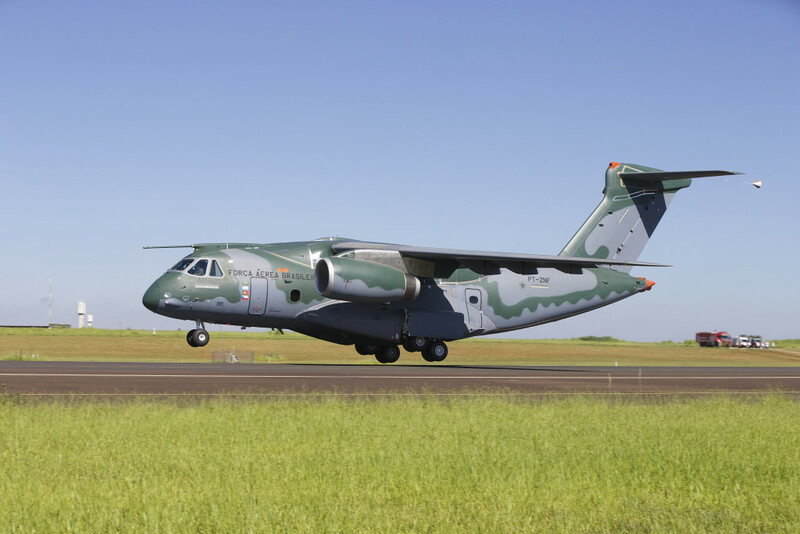 On May 20, 2014, Embraer and the Brazilian Air Force signed the serial production contract for the delivery of 28 KC-390 aircraft and initial logistic support. Besides the order from the Brazilian Air Force, there are current purchase intentions from other countries, for a total of 32 additional aircraft. The KC-390 is a military transport aircraft developed to establish new capacity and performance standards in its category, delivering at the same time the lowest life-cycle cost in the market. A genuine multimission aircraft, it can transport and launch cargo and troops, perform medical evacuation, search and rescue, as well as fight forest wildfires, among other missions. The KC-390 can also be used as aerial refueler and it has great flexibility, refueling from helicopters to high-performance fighter aircraft. 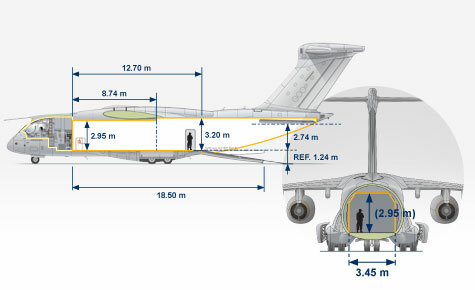 Equipped with a modern cargo handling system, the KC-390 can transport large-sized cargo such as pallets, vehicles, helicopters, in addition to troops, paratroopers, medevac stretcher or mixed configurations. The state-of-the-art integrated avionic system and a fly-by-wire flight control facilitates the aircraft piloting, reducing pilot workload and increasing the mission’s efficiency. 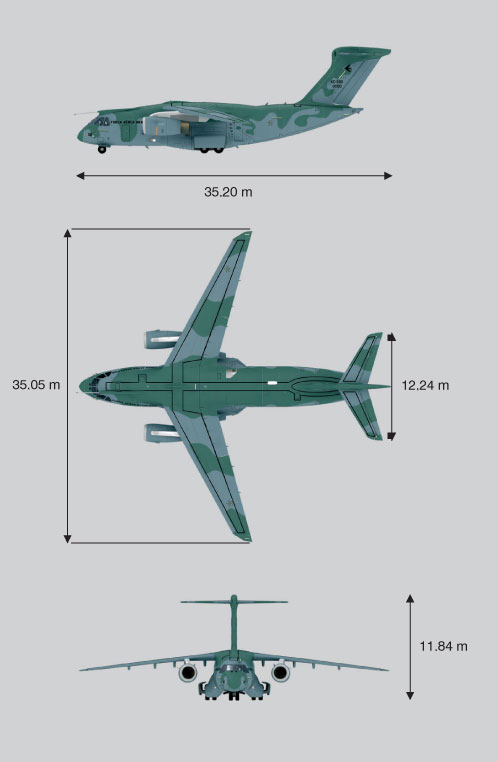 The KC-390 can also be equipped with an advanced self-defense system and has ballistic protection in critical areas, which increases the survival capacity in hostile environments. The V2535-E5 engine, rated at 31,330 pounds of thrust, was selected in July 2011 by Embraer Defense and Security and the Brazilian Air Force, which established the KC-390 requirements. 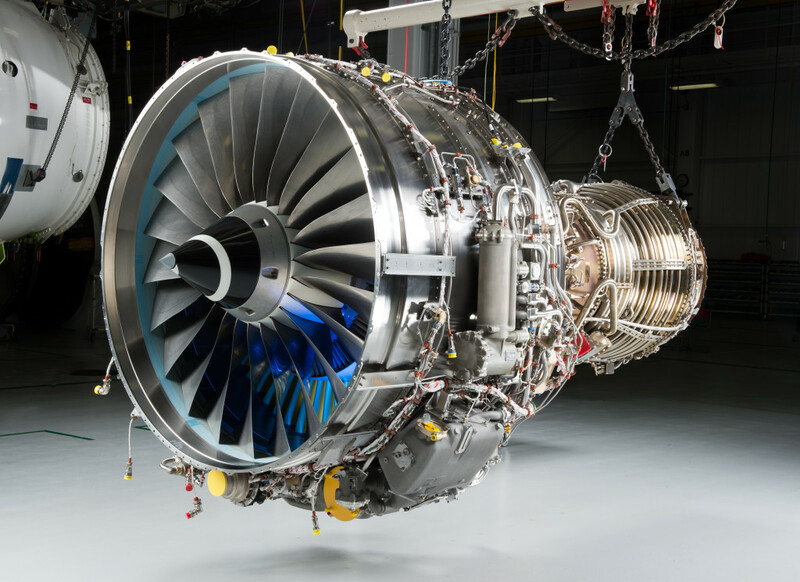 While Embraer and its customers desire maximum commonality with the V2500 engine, changes have been made to optimize installation with the new airframe. 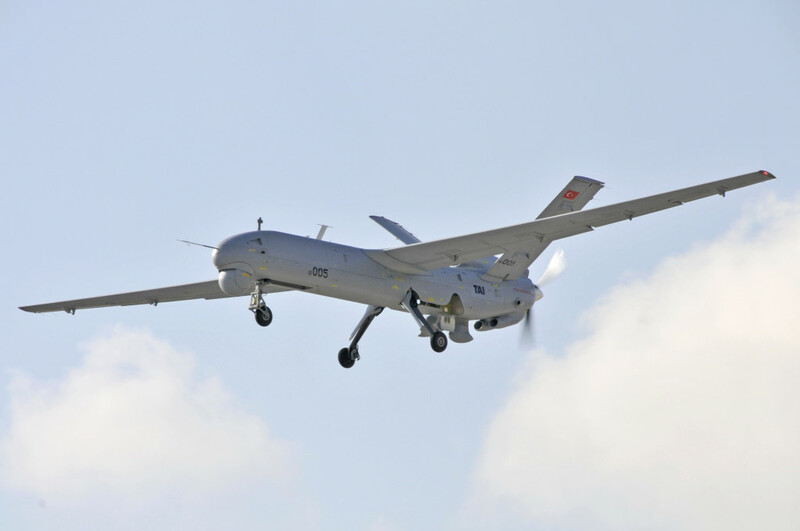 Turkey completed the maiden flight of its Anka Block B Unmanned Aerial Vehicle (UAV) on 30 January, Turkish Aerospace Industries (TAI) has announced. According to TAI the first flight included a wide degree of autonomy, with take-off, landing, and much of the flight itself being conducted by an autopilot. 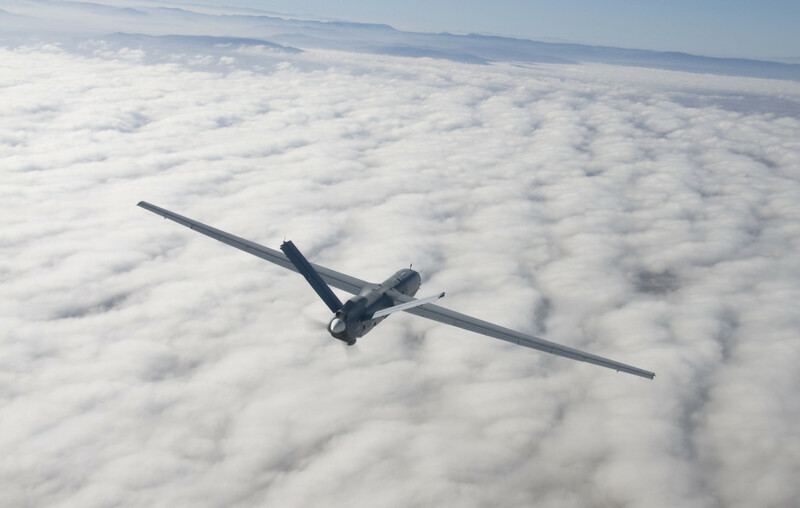 The Anka B is the second generation of the indigenous Medium Altitude Long Endurance (MALE) UAV. It is also the production standard version, with 10 Anka Block B UAVs having been ordered in October 2013 for the Turkish military. 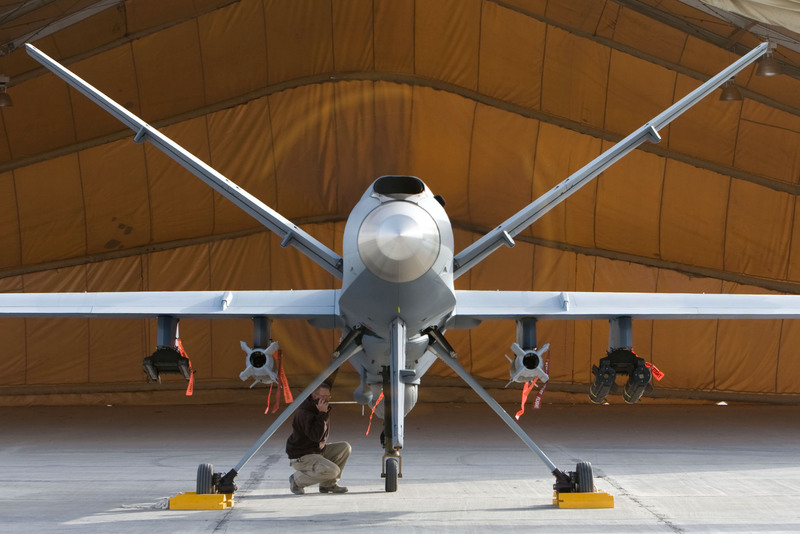 Also known as the Anka-S, the Anka Block B features a more expansive payload to the pre-series/basic Anka Block A. This includes a new High-Definition (HD) Electro Optical Infrared (EOIR) payload including a laser designator/laser rangefinder, an Aselsan/MilSOFT Synthetic Aperture Radar (SAR), Satellite Communications (SATCOM), an encrypted datalink and an indigenous flight control computer. Turkey announced in July 2012 that it would develop an armed version of the Anka. While the Anka A was unarmed, it is unclear if the Block B aircraft will be able to carry ordnance – either currently or at a later date. According to Nicholas de Larrinaga, Jane’s Defence Weekly reporter, the Anka programme has suffered some issues, including the crash of the first aircraft in September 2012 and some problems with the Anka A’s payload, but it now appears to be moving forward in line with a planned first delivery to the Turkish Air Force in 2016. All 10 Anka Bs are scheduled to be delivered by 2018. 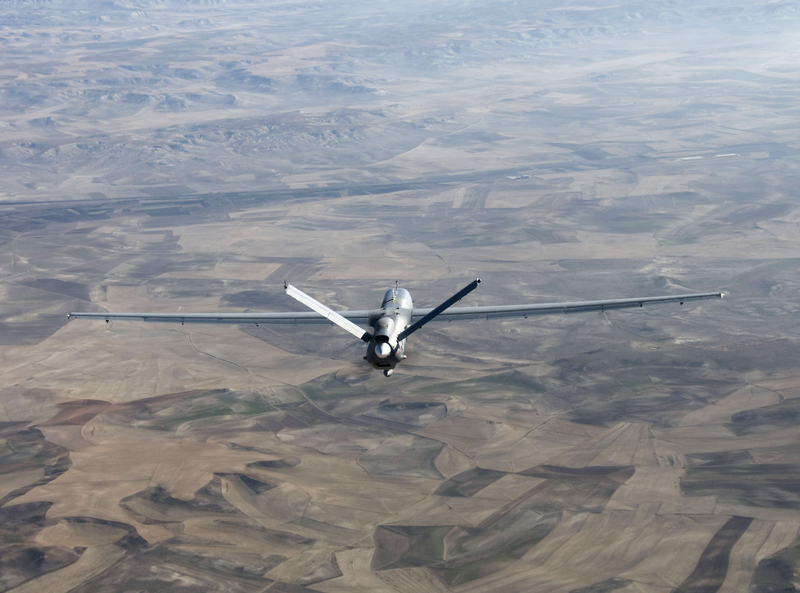 The Anka UAV is one of the headline products of Turkey’s indigenous development plan, now over a decade long, overseen by the Undersecretariat for Defence Industries. Through it, Turkey has looked to make itself broadly self-sufficient for defence technologies, with an additional goal of building itself into a major exporter of defence technologies. In developing and ordering the Anka, Turkey has positioned itself as the only European country to have a MALE UAV in production. With MALE UAVs currently a highly sought after military requirement, the type could well find success on the export market. This is particularly true in the lucrative Middle Eastern market where for various reasons the United States may be unwilling to export MALE UAVs and end-users may be unwilling to buy Israeli products. Last week, the Strategic and Theater Sealift Program Manager, Captain Henry Stevens, said that over months of at-sea testing, USNS Montford Point (MLP-1), the first ship of the U.S. Navy’s class of Mobile Landing Platform (MLP) demonstrated exceptional capabilities and inherent flexibility during her participation in a series of Post-Delivery Tests and Trials (PDT&T) events. These events, held in the Pacific Northwest and Southern California, successfully evaluated and demonstrated the performance of the ship and her systems. 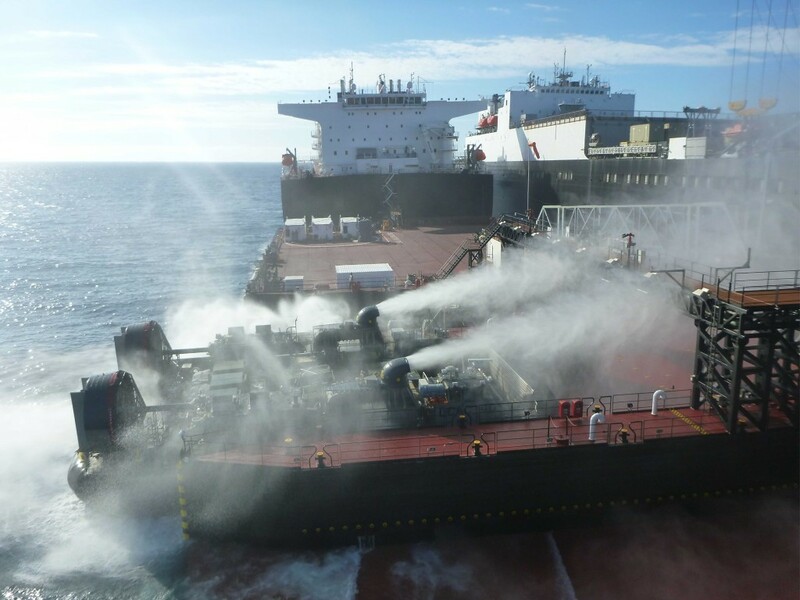 PDT&T began on Montford Point in April 2014, following installation of her Core Capabilities Set (CCS) and in advance of achievement of the ship class’ Initial Operating Capability (IOC), which the U.S. Navy looks forward to declaring in April 2015. Montford Point participated in many of PDT&T events, including the Initial Operational Test and Evaluation (IOT&E) end-to-end event, designed to determine the operational effectiveness and suitability of the program. Directly following completion of the end-to-end event, and without pulling into port, USNS Montford Point (MLP-1) displayed her capabilities during the Fleet’s Pacific Horizon 2015, a week-long scenario-driven humanitarian assistance and disaster relief exercise. 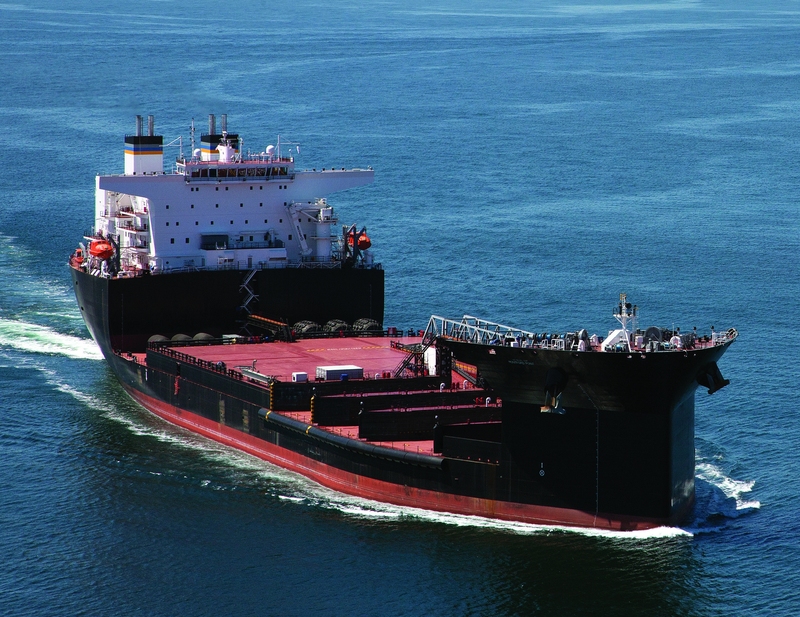 Throughout the course of these tests and exercises, USNS Montford Point demonstrated many of her capabilities by interfacing with prepositioning ships and the Improved Navy Lighterage System (INLS) to offload equipment and supplies for transshipment to shore by Landing Craft Air Cushion (LCAC). These capabilities are the cornerstone of the U.S. Navy’s seabasing strategy, further enabling large-scale logistics movements from sea to shore forces and prepositioned Marine Corps equipment from the Sea Base to the shore, significantly reducing dependency on foreign ports. 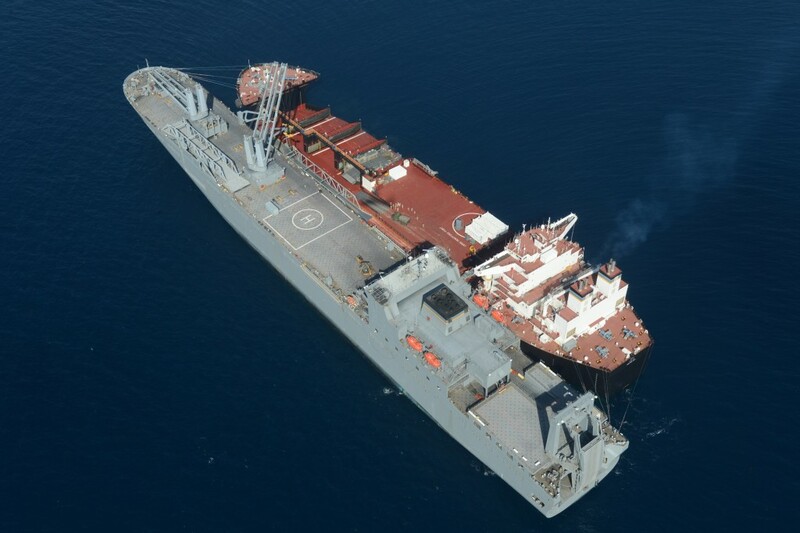 The Mobile Landing Platform will become the centerpiece of the Sea Base. It will facilitate the selective offload of prepositioned equipment. 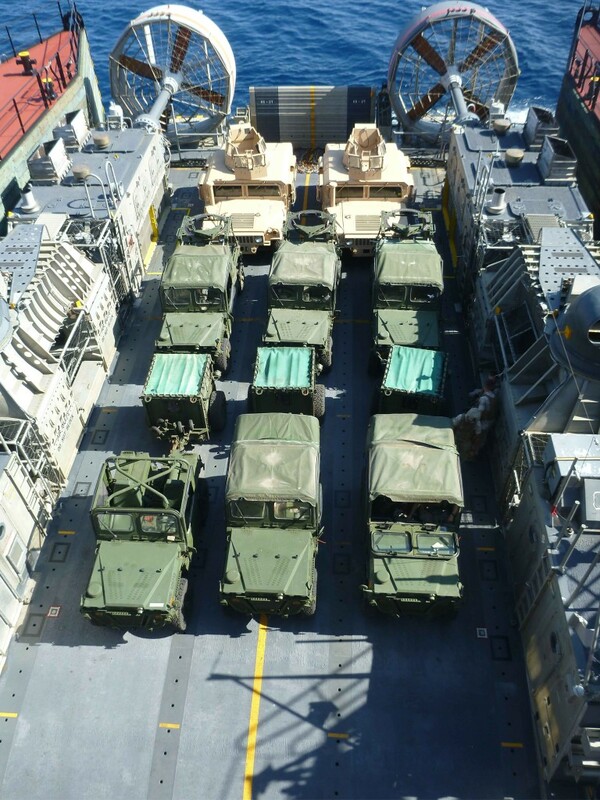 In concert with JHSV (Joint High Speed Vessel) and prepositioned LMSRs (Large, Medium-Speed Roll-on/Roll-off Ships), MLP will facilitate movement of forces and prepositioned Marine Corps equipment from the Sea Base to the shore via LCAC. The MLP is planned for use across the range of military operations including Humanitarian Assistance/Disaster Response (HA/DR), Theater Security Cooperation, and Major Combat Operations. According to Rahul Bedi, Jane’s Defence Weekly correspondent, India has invited Japan to compete in the Indian Navy’s (IN’s) long-delayed INR500 billion ($8.1 billion) Project 75I (India) requirement for 6 diesel-electric submarines with land attack and Air Independent Propulsion (AIP) capabilities. 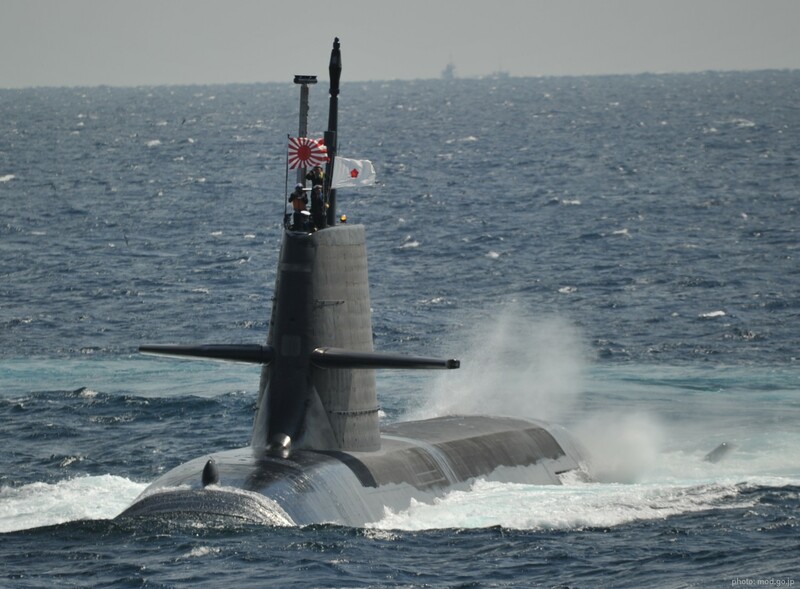 Official sources said India had recently forwarded a proposal to Tokyo asking it to consider participating in the Project 75I tender with its 4,200-tonne Soryu-class submarine. 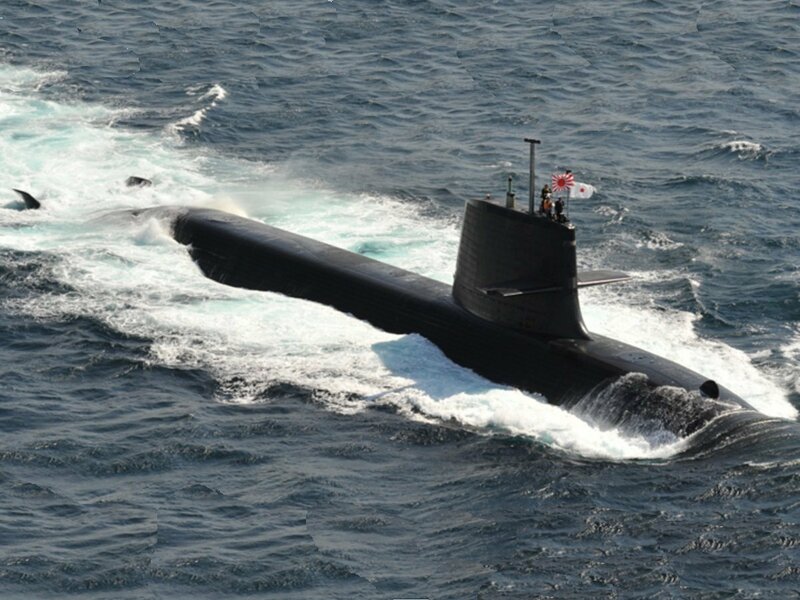 In this connection it is interesting to note that the Soryu class is currently under evaluation by the Royal Australian Navy as a replacement for its six Collins-class boats. India’s offer to Japan to join Project 75I is part of Prime Minister Narendra Modi’s effort at forging closer strategic and defence ties with Tokyo and formulating a wider maritime quadrilateral grouping that would include Australia and the United States. 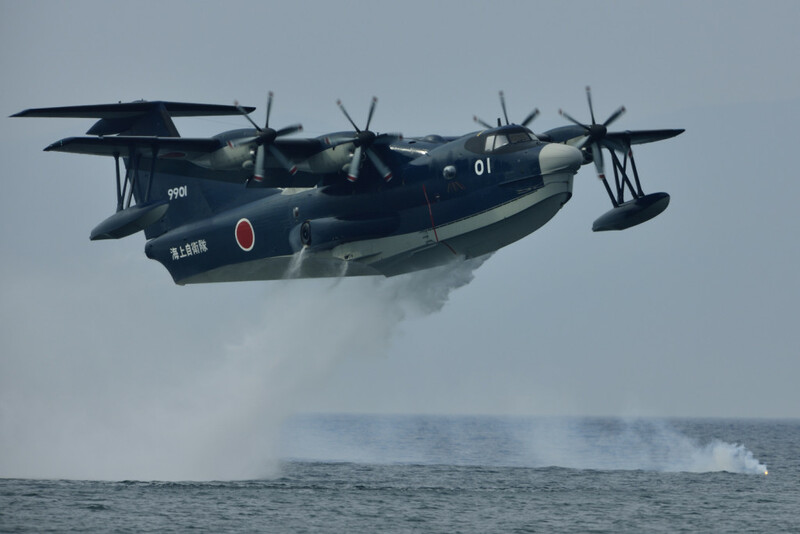 India is also in advanced negotiations with Japan to acquire 12 ShinMaywa US-2i (formerly Shin Meiwa) amphibious search-and-rescue aircraft for around $1.65 billion, a deal that is likely to be concluded in early 2016. The Project 75I tender, delayed by nearly seven years, was approved by the Ministry of Defence (MoD) in October 2014 and is likely to be dispatched later this year. It is aimed at boosting the IN’s underwater assets, which at 11 submarines is 13 fewer than their sanctioned strength. Project 75I envisages licence-building a submarine shortlisted from multiple contenders, including DCNS (France), TKMS subsidiary HDW (Germany), Navantia (Spain) and Rosonboronexport (Russia), under a Joint Venture (JV) with an Indian shipyard. A committee headed by Vice Admiral A.V. Subedar recently completed an audit of seven domestic shipyards – five of them state-owned and two private – to evaluate their submarine-building capability. Officials said it would submit its report to the MoD in February, after which the selected shipyards, along with IN-approved overseas submarine manufacturers, would be invited for trials around 2016 and a platform shortlisted by 2018. Price negotiations would follow, and IN officials anticipate the first Project 75I submarine being commissioned around 2025-27. Meanwhile, the MoD has for the third time postponed the deadline for local vendors to respond to its Requests for Information (RfI) to indigenously build more than 140 twin-engine Naval Utility Helicopters (NUH). Industry sources said the RfI response date, for nine potential local bidders, was deferred to 28 February – from the earlier deadlines of 24 November 2014 and 24 January – as many had been unable to conclude JVs with foreign original equipment manufacturers. India is keen for Japan to participate in its domestic materiel manufacturing programmes as it is seeking technology to boost its defence industrial base. It is also keen to propagate its bilateral strategic partnership with Japan to counter China’s growing military assertiveness in the South China Sea and the Indian Ocean Region (IOR). Both countries have unresolved territorial disputes with China that erupt periodically. The United States has also been advocating increased defence co-operation between India and Japan and Australia, which shares their collective concerns regarding China.